The Commodore Amiga CD32 was Commodore’s Fifth generation era home video console, and was launched early September 1993. Commodore reported to have sold over 100,000 units in Europe in just three months prior to Christmas. By outselling Sega four to one and claiming 38% market share of all CD ROM drives sold in the UK (according to the Gallup Weekly Report), the Amiga CD32 has established itself as the undisputed leader of the 32 bit machines. Electronic Gaming Monthly agrees by rating the CD32 higher than Sega CD, 3DO or Jaguar. At a suggested retail price of just $399, the Amiga CD32 features an unbeatable combination of power and affordability. It was based on Commodore’s Advanced Graphics Architecture chipset, and is of similar specification to the Amiga 1200 computer. On its release, the CD32 was marketed by Commodore as “the world’s first 32-bit CD games console”. The Amiga CD32 featured a 32 bit Motorola 68EC020 Microprocessor with 2MB of memory, 16.7 million colors, and a double speed CD ROM drive built in. The CD32 could play audio CDs, and most CDTV discs. With the addition of an optional MPEG-1 full motion video module, the CD32 can play MPEG VideoCDs, MovieCDs and Karaoke CDs with up to 74 minutes of better-than-VHS quality video and CD quality audio on a single disc. The Amiga CD32 launch bundle includes two games, Diggers, a new game from Millennium Interactive, and Oscar from Flair Software. A later pack includes the one-on-one fighting game Dangerous Streets. The AmigaCD32 was launched with over 50 games and over 100 extra games would have been released by the end of 1993, sadly groundbreaking games such Lost Eden and Megarace never got released. However, a deadline was reached for Commodore to pay 10 million USD in patent royalty to Cad Track (U.S. Patent 4,197,590) for their use of their XOR patent. A federal judge ordered an injunction against Commodore preventing them from importing anything into the United States. Commodore had built up CD32 inventory in their Philippine manufacturing facility for the United States launch, but, being unable to sell the consoles, they remained in the Philippines until the debts owed to the owners of the facility were settled. Commodore declared bankruptcy shortly afterwards, and the CD32 was never officially sold in the United States. 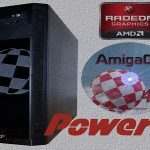 If the CAD patent would have never occurred the the AmigaCD32 would have probably sold near 1,000,000, units for sure. None the less, Commodore’s AmigaCD32 would have faced strong competition with the upcoming Sony Playstation and Sega’s Dreamcast, pushing it out of the mainstream market anyway. The Commodore Amiga CD32 is still being supported by the Amiga community and has new releases on a very regular basis.